I’m doing two radio interviews about the book this weekend. On Saturday night, I will join Freedom Riders Claire O’Connor, Zev Aelony and Thomas Armstrong on Radio Free Nation. The show starts at 8:30PM EST, and I should be on around 8:45PM or so. Tune in here. On Sunday, I will talk with John Batchelor at 5PM EST on his show, which airs on WABC-AM in New York City and KFI-AM in Los Angeles. Update: The interview will air Sunday night at 9:30PM PST on KFI-AM. The book tour kicks off at the Smithsonian in Washington, DC, next Thursday, May 22. 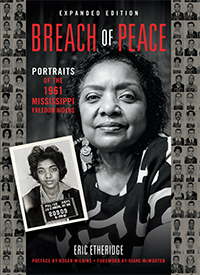 I will be appearing with Freedom Riders John Lewis and Joan Mulholland as well as Roger Wilkins, who wrote a terrific introduction for the book. The event starts at 6:45 at the S. Dillon Ripley Center. Buy your tickets here.